The Las Flores Water Company is a utility service which specializes in the treatment, maintenance and distribution of drinking water supplies and irrigation systems in central and northern Altadena, located just east of the Mountain View Cemetery. The company maintains two reservoirs and a well near the business office. 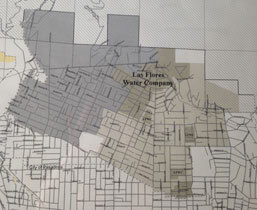 Las Flores Water Company, Inc. was organized in 1885 by charter members, Peter Gano and Dr. L. A. Wright. The original water source was located in Las Flores Canyon, an area at the top of Lake Avenue, just east of the Cobb Estate. The shareholders are an integral part of the Las Flores Water Company. They number over 1,400 and are key to our success.